Very knowledgeable and friendly staff. Fuse blew and they were timely in contacting repairman to come and reset breaker. We enjoyed our stay, very relaxing and took full use of the gas fireplace as it was typical November weather while we were in CB. Kevin was great! I got stuck in traffic coming down from Seattle and was five minutes past closing. He waited for me to arrive do he could check us in. Susan was helpful when I called her about the Weber blowing off the deck. She okayed me to leave it folded up on the deck so it wouldn't blow off again with a potential to damage property or hit someone. I liked staying at Gulls Nest. It was centrally located and just the right size for one person and my dog. Other then the slow sink in the bathroom and the garbage can wasn't pushed out for the Monday pick up, it was another great place and we look forward to coming back again! Thanks for the heads up on the sink! Already taken care of ! We look forward to your return. Condo is very roomy and comfortable. Loved the keyless entry! Thanks for the great visit! The team is always a pleasure to work with and very helpful! 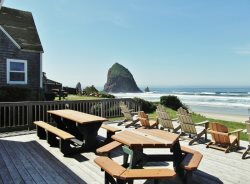 We have rented from Cannon Beach Vacation Rentals for several years. The staff are very friendly and helpful. The properties are always clean and well maintained. Made the mistake of renting VRBO once, won't do that again! We had a wonderful stay, the home has a great floorplan and is well stocked with everything you may need. The interior is a bit dated. It would be nice if there was a deck on the beach side yard so you sit there and watch the ocean. we had a great time and loved the property. It does look a little old from the outside but has everything you need for either one night or longer. It is exceptionally clean and well maintained. Everyone was great and well-informed. All very nice. We really enjoyed it! We truly relaxed and had a great time.